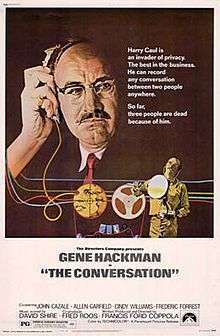 The Conversation is a 1974 American psychological mystery thriller film written, produced and directed by Francis Ford Coppola and starring Gene Hackman with supporting roles by John Cazale, Allen Garfield, Cindy Williams, Frederic Forrest, Harrison Ford, Teri Garr and Robert Duvall. The Conversation won the Palme d'Or at the 1974 Cannes Film Festival. It was nominated for three Academy Awards in 1974 and lost Best Picture to The Godfather Part II, another Francis Ford Coppola film. In 1995, it was selected for preservation in the National Film Registry by the Library of Congress as being "culturally, historically, or aesthetically significant". Originally, Paramount Pictures distributed the film worldwide. Paramount retains American rights to this day but international rights are now held by Miramax Films and StudioCanal in conjunction with American Zoetrope. Harry Caul (Gene Hackman) is a surveillance expert who runs his own company in San Francisco. He is highly respected by others in the profession. Caul is obsessed with his own privacy; his apartment is almost bare behind its triple-locked door and burglar alarm, he uses pay phones to make calls, claims to have no home telephone and his office is enclosed in wire mesh in a corner of a much larger warehouse. Caul is utterly professional at work but finds personal contact extremely difficult because he is intensely secretive about even the most trivial aspects of his life. Dense crowds make him feel uncomfortable and he is withdrawn and taciturn in more intimate social situations. He is also reticent and obsessively secretive with colleagues. His appearance is nondescript, except for his habit of wearing a translucent grey plastic raincoat almost everywhere he goes, even when it is not raining. Despite Caul's insistence that his professional code means that he is not responsible for the actual content of the conversations he records or the use to which his clients put his surveillance activities, he is wracked by guilt over a past wiretap job which resulted in the murder of three people. This sense of guilt is amplified by his devout Catholicism. His one hobby is playing along to jazz records on a tenor saxophone in the privacy of his apartment. Caul, his colleague Stan (John Cazale) and some freelance associates have taken on the task of bugging the conversation of a couple (Cindy Williams and Frederic Forrest) as they walk through crowded Union Square in San Francisco, surrounded by a cacophony of background noise. Amid the small-talk, the couple discuss fears that they are being watched, and mention a discreet meeting at a hotel room in a few days. The challenging task of recording this conversation is accomplished by multiple surveillance operatives located in different positions around the square. After Caul has worked his magic on merging and filtering different tapes, the final result is a sound recording in which the words themselves become crystal clear, but their actual meaning remains ambiguous. Although Caul cannot understand the true meaning of the conversation, he finds the cryptic nuances and emotional undercurrents contained within it deeply troubling. Sensing danger, Caul feels increasingly uneasy about what may happen to the couple once the client hears the tape. He plays the tape again and again throughout the movie, gradually refining its accuracy. He concentrates on one key phrase hidden under the sound of a street musician: "He'd kill us if he got the chance". Caul constantly reinterprets the speakers' subtle emphasis on particular words in this phrase, trying to figure out their meaning in the light of what he suspects and subsequently discovers. Caul avoids handing in the tape to the aide (Harrison Ford) of the man who commissioned the surveillance (Robert Duvall). Afterwards, he finds himself under increasing pressure from the client's aide and is himself followed, tricked, and bugged. The tape of the conversation is eventually stolen from him in a moment when his guard is down. Tormented by guilt over what he fears will happen to the couple, Caul's desperate efforts to forestall tragedy fail. To Caul's surprise, it turns out that the conversation he had obsessed over might not mean what he thought it did: the tragedy he had anticipated is not the one which eventually occurs. He is led to believe that his own apartment has been bugged and goes on a frantic search for the listening device, tearing up walls and floorboards and destroying his apartment to no avail. He sits among the wreckage, playing the only thing in his apartment left intact: his saxophone. Gene Hackman's brother, Richard Hackman, played two roles in the film, the priest in the confessional and a security guard. Gian-Carlo Coppola, the nine-year-old son of director Francis Ford Coppola, played the small part of a boy in church. The Conversation features a piano score composed and performed by David Shire. The score was created before the film was shot. On some cues, Shire used musique concrete techniques, taking the taped sounds of the piano and distorting them in different ways to create alternative tonalities to round out the score. The score was released on CD by Intrada Records in 2001. The film made $4,420,000 in its domestic gross on a $1,600,000 budget. The film currently holds 98% on Rotten Tomatoes with an average of 8.6/10 based on 43 reviews of which 42 were positive and 1 negative with the consensus: "This tense, paranoid thriller presents Francis Ford Coppola at his finest—and makes some remarkably advanced arguments about technology's role in society that still resonate today." In 1995, The Conversation was selected for preservation in the United States National Film Registry by the Library of Congress as being "culturally, historically, or aesthetically significant". Gene Hackman has said it's his favorite of all the films he's made. In 1997, British electronic musician Kevin Martin, an admirer of the film, released an unauthorized soundtrack CD titled Tapping The Conversation under the alias The Bug. Martin's notes for the CD stress that he used no audio samples from the film. The lyrics of The Twilight Singers song "The Conversation", from the 2006 album Powder Burns, were inspired by the film. According to Kaiser, the final scene of the film - in which Caul is convinced he is being eavesdropped in his apartment, cannot find the listening device, and consoles himself by playing his saxophone - was inspired by the passive covert listening devices created by Léon Theremin, such as the Great Seal bug. "He couldn't find out where [the bug] was because it was the instrument itself." ↑ "Festival de Cannes: The Conversation". festival-cannes.com. Retrieved 2009-04-26. ↑ Townsend, Sylvia (19 December 2014). "Haskell Wexler and the Making of 'One Flew Over the Cuckoo's Nest'". Retrieved 2 March 2015. ↑ "The 47th Academy Awards (1975) Nominees and Winners". oscars.org. Retrieved 2 October 2011. ↑ "Living the movie, As sound". Retrieved 20 June 2014.